A brightly colored, patterned, and textured ring stacking toy for babies and toddlers. Each ring has a button that makes a different animal sound. Zolo's Kushies toys have bright colors, fun designs, and different textures. The Zolo Boa is a stacking toy for babies and toddlers. There are four rings, and each one makes an animal sound- either a cow, frog, pig, or bird. Batteries are included. A stacking toy for children with four brightly colored, textured rings. Each ring has a small button that can be pressed to make an animal noise- a bird, cow, pig, or frog. Batteries are included. Children can take the rings off of the center piece and hear the different animal sounds. Each ring is made of a different textured fabric, and children who are teething can chew on them. Every ring has a small button inside that can be pressed to make an animal sound. Kushies toys are made out of brightly colored cloth with different patterns and textures. 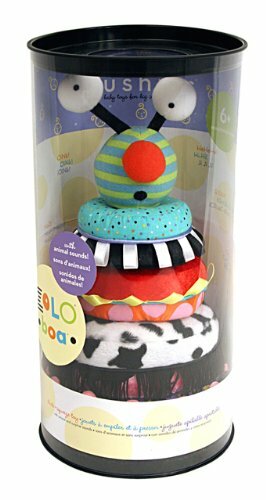 The Kushies Zolo Boa is a stacking toy. There are four soft rings that stack on top of each other, and at the top, there is a little plush head. All of the rings have different textures, including velour and a fuzzy fleece-like fabric. Animal sounds can be activated by pushing the button inside on the ring. There are four animal sounds- a bird, cow, pig, and frog. On top, the little bug head giggles when the child has stacked all of the rings on the base. Several users said that the patterns on the rings are very visually appealing, and children are attracted to the variety of colors and designs. The buttons to activate the animal sounds are located inside each ring, and some users have said that an adult is needed to press the button because it can be difficult for children to find the button and press down on it. Also, the rings have been said to fit really tight around the center piece. Because of this, young kids tend to have trouble putting all the rings on the base because it takes a lot of strength to squeeze them on. The toy comes with four, soft rings and a plush head at the top that giggles when all the rings are stacked to the top. Some of the rings also have little ribbons that kids can grab on to or chew on. Users did not have any major concerns, but several comments were made that it was too difficult to stack the rings on the center piece. The center piece was either too thick or the rings wouldn’t stretch out enough to get them on. Some reviewers were concerned about this because their children were unable to stack the rings, which is what the toy was made for. 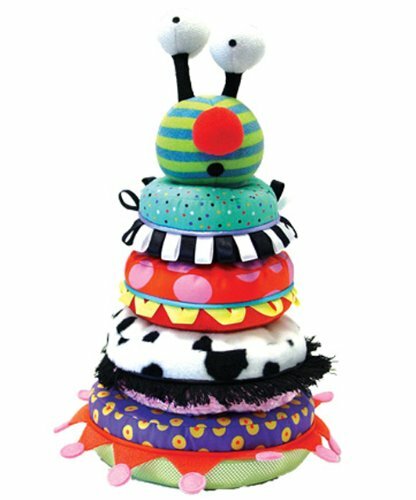 A stack & squeeze toy to promote tactile and auditory development with four squishy fabric rings each having a different sound & texture. When stacking is complete, its giggling head congratulates the child.